Do you know how to spot a betta fish illness? If you see a betta struggling to swim, that's one sure sign he's sick. Learn to watch for other signs that will help you get him the treatment he needs that much sooner. Most bettas will display one or more of the following signs when they feel ill. Use them to take stock of your pet's health. Betta fish can be very active, but they do stop and take time to rest and even sleep. Due to this fact, it may not be immediately apparent to you that your betta is less active than usual until some time has passed. You may notice that your fish lists aimlessly at the top of the tank with his mouth at the water's surface. On the other hand, he may settle into a secluded spot at the bottom of his tank and show no interest in anything going on around him. Bettas are curious and territorial creatures, so if your pet stops investigating his surroundings for any significant amount of time, he may be ill.
Bettas have very healthy appetites, so one of the first indicators of an illness is usually when a fish shows no interest in his food. This is why it's so important to watch your fish when you feed him and make sure he eats. If he refuses his food for more than one meal, you'll want to examine him a little closer to see if you notice any other signs of potential illness. Some fish begin to look like they are wasting away even if they haven't gone off their food. This could be a sign that your pet's current diet is lacking in important nutrients. Most hobbyists recommend offering bettas a varied diet that includes betta pellets, fresh, or frozen brine shrimp and freeze-dried bloodworms. Some diseases interfere with a betta's ability to swim normally. 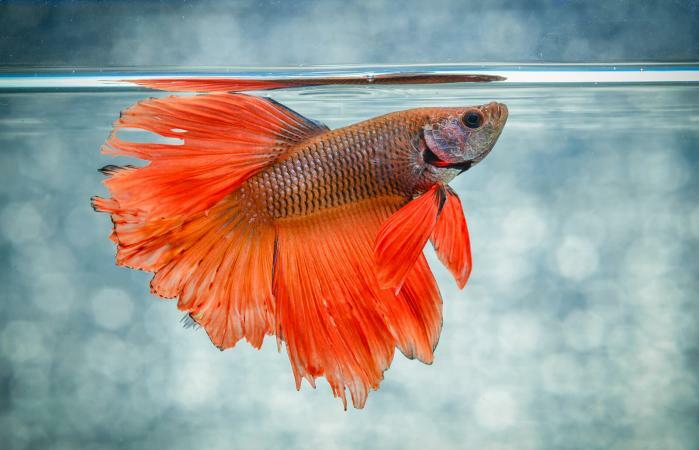 If your is fish struggling to swim up or down, or if your betta fish is swimming on on his side or upside down, it could be a sign that his swim bladder is either infected or injured. Your betta laying or floating on one side is also a sign. Bettas tend to clamp their fins when they don't feel well. Beyond that, fins that begin to look frayed or as if they are being eaten away may be a sign of a fin rot infection. If your betta's body suddenly looks puffed up, it could be a sign of constipation, but it could also be sign of a condition called dropsy which can be life threatening. With dropsy, the entire fish swells up, and the scales stand out a bit from the body. Once you've noted any specific signs of illness your betta shows, it's time to try to determine which disease or condition is making him sick. You can compare his symptoms to a variety of the most common betta diseases, but if you're still not sure what's wrong, give your local aquarium shop or vet clinic a call and describe what you see. Someone on the staff may be able to hazard an educated guess about what your fish has and recommend a specific treatment that can help. Remember, the time you spend observing your betta means you know him better than anyone. If your gut tells you something isn't quite right, it's probably true. Trust your instincts, try to note as many symptoms as you can, and get your fish the treatment he needs as quickly as you can.